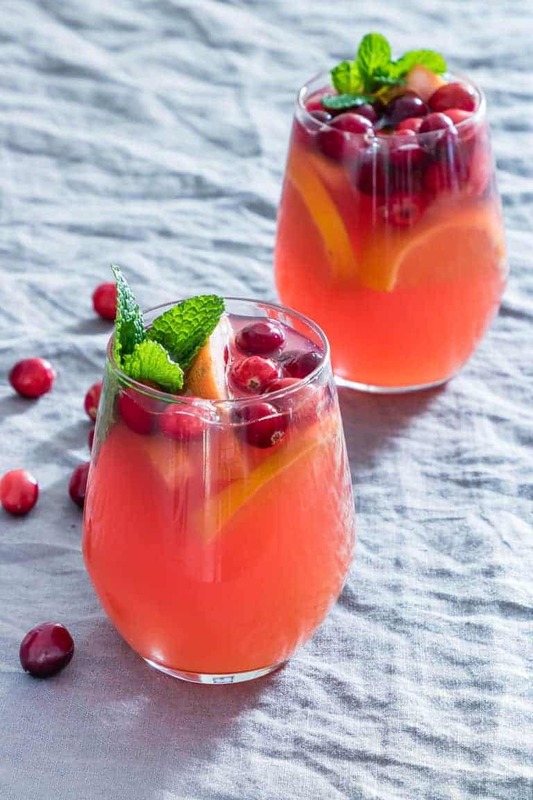 This Easy Festive Fruit Punch is perfect for entertaining during the busy holiday season. It requires just a few simple ingredients and comes together so quickly. The beautiful sliced fruit and berries make a stunning presentation that will make your Christmas party, or any celebration, merry and bright! Suitable for Vegan and Gluten-free diets. Post includes Weight Watchers Points. Delighted to have teamed up with Cuisinepro and House to bring you this recipe. Although it is a sponsored partnership, all opinions are my own. Peeps, my favourite time of year has finally arrived. As you may know, I absolutely loooooooove Christmas, and I eagerly await the arrival of the Christmas season all year long. And now that it is officially here, it is time to celebrate. And in my world, celebrating means cooking. I’m planning to host several informal gatherings and larger Christmas parties, which means I will be happily chopping, slicing and dicing my way through the season. One of my must-haves at all these events is a festive fruit punch. Because I think it’s not really a party unless punch is served. 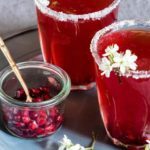 And this Easy Festive Punch recipe comes together so quickly and requires just a few ingredients, so it is perfect for entertaining during the busy holiday season. 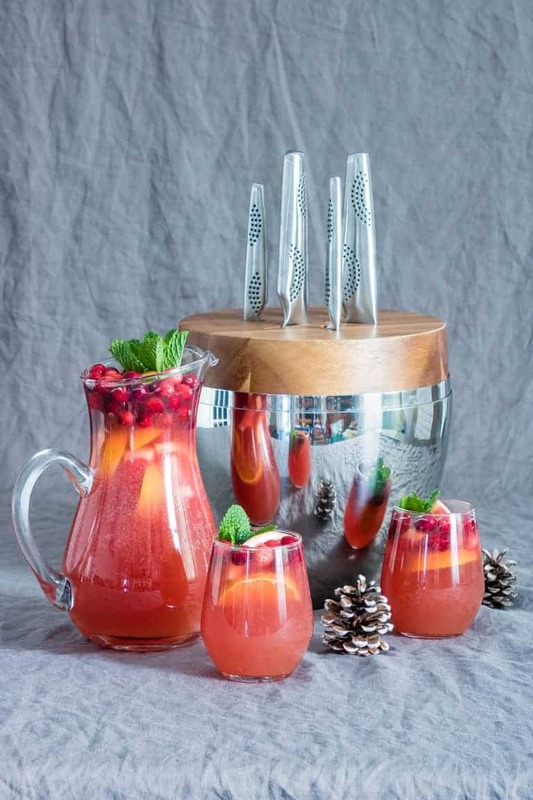 The sliced fruit and berries don’t just add a wonderful fresh flavour, they make this Christmas Punch a visually stunning centerpiece that will really wow your guests. And this year I will be slicing up all my oranges and lemons using the 6 amazing knives that come in THE EGG™ by Cuisinepro. A bit more about these knives later on in the post. Slice oranges and lemons and set aside. 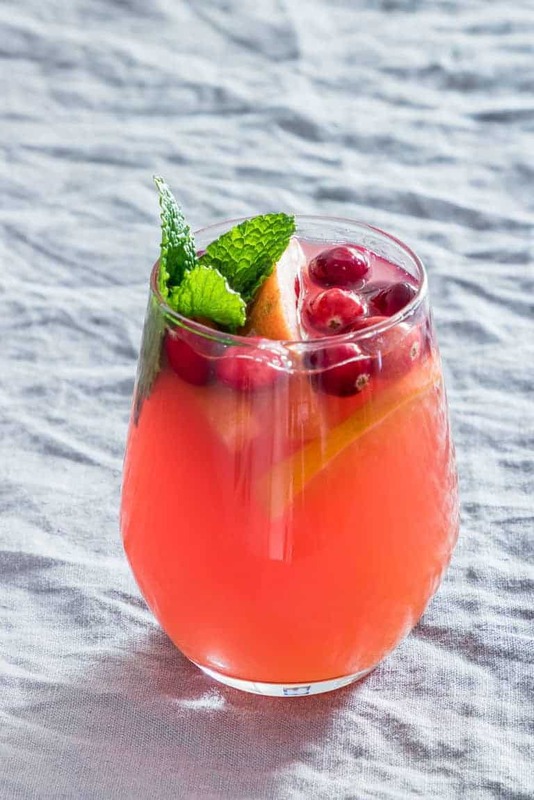 Combine cranberry juice, pineapple juice, ginger beer, white wine, and rum in a large beverage dispenser or punch bowl. Stir to mix well. Add cranberries and fruit slices and stir. 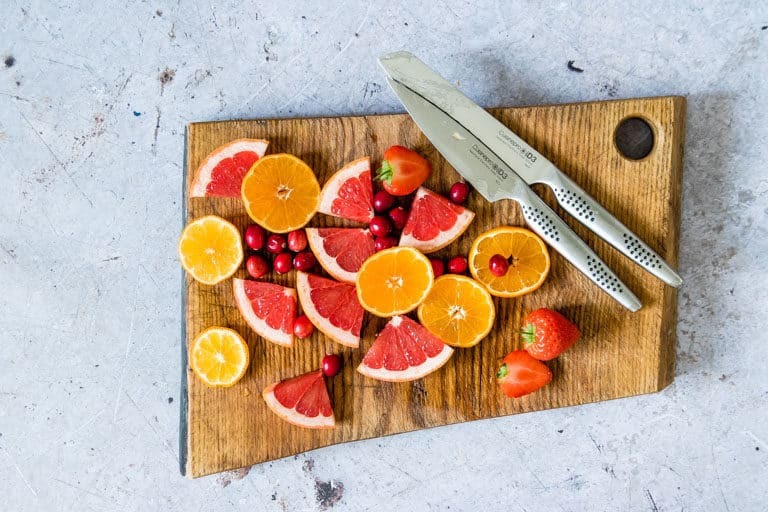 Get a jump on your prep work by slicing the fruit in advance and store in airtight containers in the fridge until you’re ready to make the punch. Try adding scoops of sherbet or sorbet for extra delicious flavour and a dramatic presentation. Make an ice ring to float inside the punch and keep it chilled longer (see below for complete instructions). Fill your pan about a half of the way with water or fruit juice. Add sliced oranges, lemons, berries, mint leaves, even edible flowers to the pan. Place in freezer for approximately 4-6 hrs, until solid. You can also make your ice ring a day ahead and freeze overnight. To unmold the ice ring, let it sit at room temperature about 20 mins, or place the pan in hot water for about 1 min. 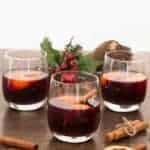 Sleigh Ride Sangria: Apple Cider + Ginger Beer + White Wine. Reindeer Fizz: Cranberry Juice + Seltzer Water + Raspberry Sherbet. New Year’s Countdown: Pomegranate Juice + Prosecco + Vodka. Can I Make Festive Fruit Punch in Advance? Yes, you can mix everything except for the ginger beer (or other carbonated liquids) together in advance. Store in an airtight container in the fridge until it’s time to serve. 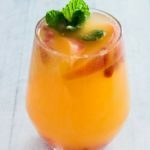 Since the fizzy kick of carbonated beverages in your punch typically starts to fade after a couple of hours, you’ll want to add those in just prior to serving. 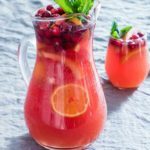 You can easily make this Fruit Punch With Lemonade instead by swapping the ginger beer for some lemonade. You can make it non-alcoholic. 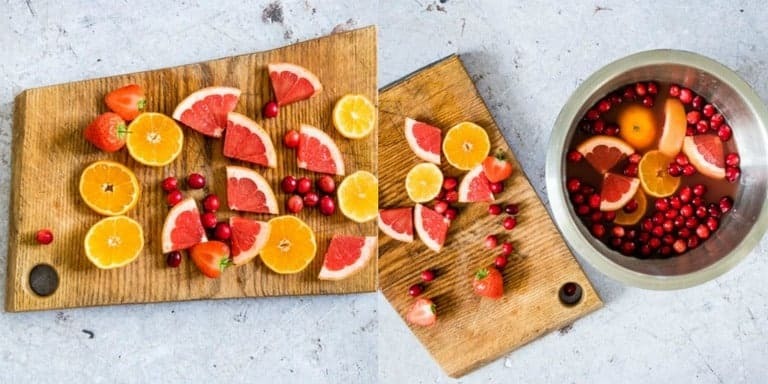 For our Christmas parties, I make a kids-friendly variation that includes sparkling water, orange juice, pomegranate juice and extra slices of fruit. There are 6 Freestyle Points in one serving of Easy Fruit Punch recipe. And this year I will be slicing up all my oranges and lemons using the 6 amazing knives that come in THE EGG™ by Cuisinepro. I must admit that when I first laid eyes on this super sleek and modern knife block, I had to immediately had to have one. THE EGG™ is sooooo beautiful to look at, it’s like having a piece of art on your countertop. I love that it has a push-button handle at the top so you won’t leave unsightly finger marks on the steel when opening. It also comes in a luxurious velvet storage bag, but trust me when I say you will not want to pack this gorgeous set up once you try it. And the 6 knives are a dream to work with. The handles fit just right in your hand and they do their jobs perfectly. 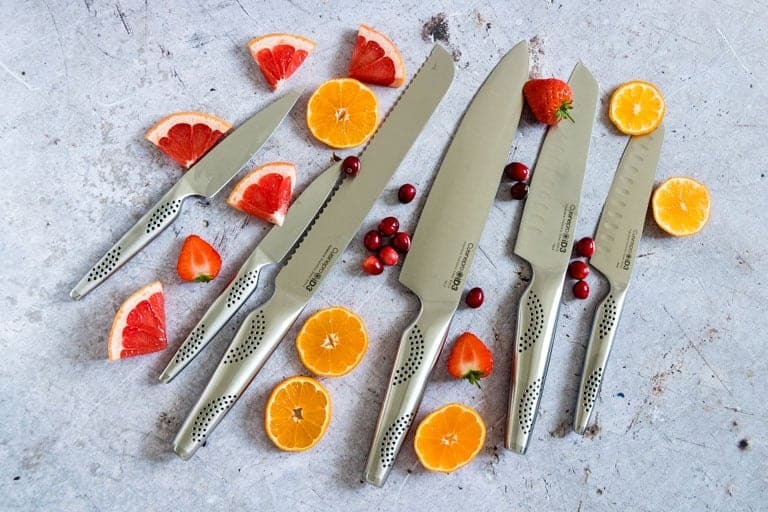 The knives are hand-crafted from Japanese steel and come with a lifetime guarantee, making this one gorgeous kitchen accessory that is built to last. As someone who loves to cook, I admit to being a bit knife-obsessed. Using the proper size and style of knife for the particular task at hand makes a huge difference to me. So I am pleased to report that the 9cm paring knife and 12cm utility knife included in this set were the ideal choices for preparing all of the different fruit for my festive punch. Recently I’ve been on the hunt for a good sturdy bread knife. And folks, I have found it. The one included in this set made it so incredibly easy to cut the perfectly thin baguette slices I needed for my pistachio, feta & pomegranate crostini appetiser. The Chef’s knife is proving to be great for many tasks, and I have been using it for anything from slicing and mincing meats to dicing and chopping up vegetables. Why not give a different kind of Christmas egg this year? Preparing delicious Christmas punch with these amazing Cuisinepro knives will definitely make the holidays merry and bright. THE EGG™ is available exclusively in all HOUSE stores and online at www.HouseUK.com. HOUSE is homewares and kitchen specialist that opened 5 store locations in the UK in earlier this year, with 3 more stores set to open before Christmas. Cuisinepro is the king of the kitchen and one of the most premium cookware and knife brands, with a wide range of exceptional products found in kitchens worldwide. 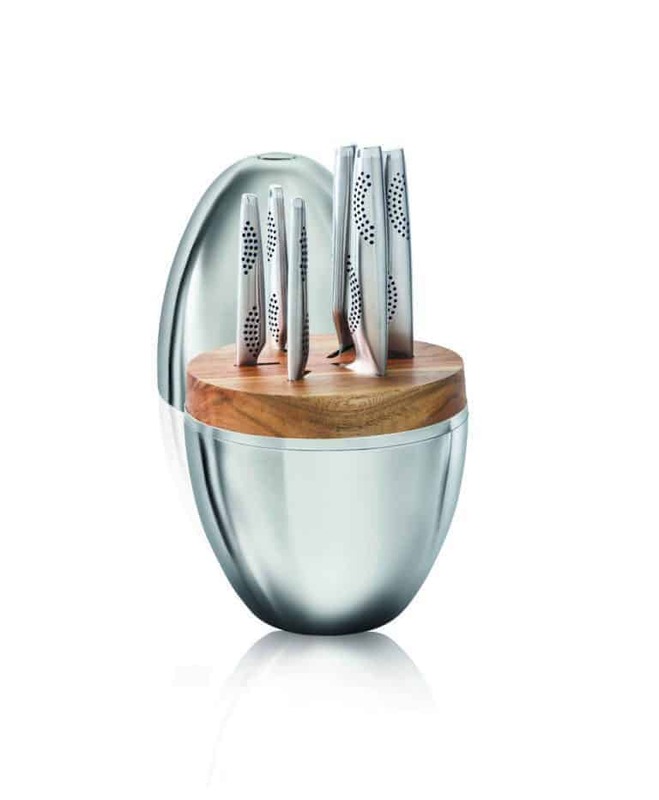 Well lovely readers, I am chuffed to say that the team at Cuisinepro have kindly agreed for one of you to win The EGG™ Knife Block Set Worth £750. This way you get to try some of their knives yourself…. To be in with a chance of winning this all you have to do is all you have to do is enter via the rafflecopter form below. You can even win extra entries by tweeting and sharing some of my recipes each day. This giveaway is open to UK entrants only and runs until Monday December 17th. For more prizes visit my giveaway page. 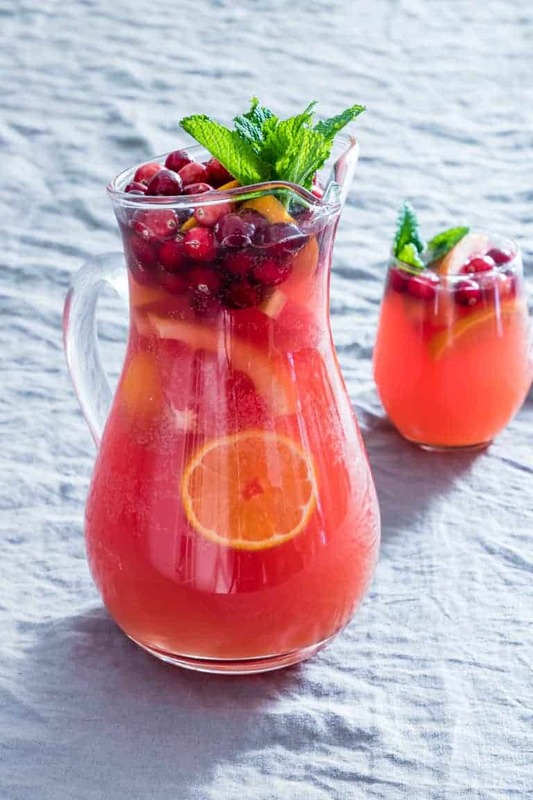 Thank you for reading my Easy Festive Fruit Punch recipe post. And please come visit again as I continue dreaming up recipes, traditional African recipes, African fusion recipes, Sierra Leone recipes, travel plans and much more for you. Thanks for supporting Recipes from a Pantry, UK food blog. 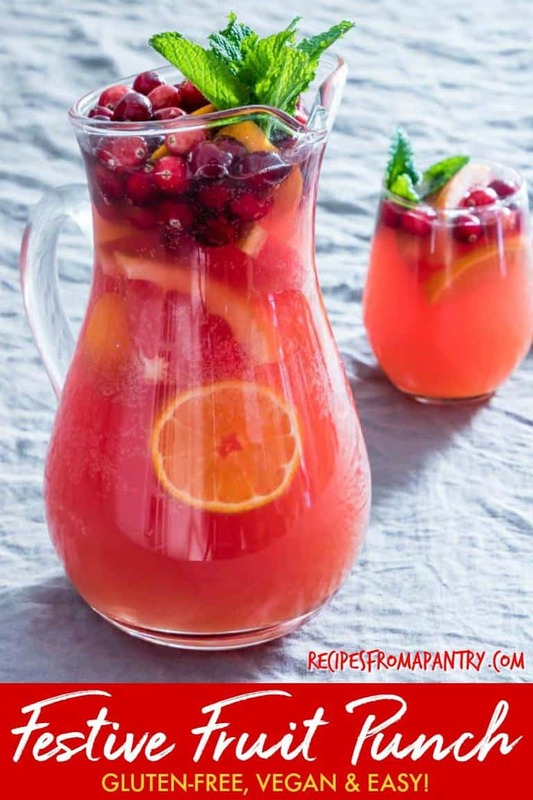 Don't forget to tag #recipesfromapantry on Instagram or Twitter if you try Easy Festive Fruit Punch! It is really, really awesome for me when you make one of my recipes and I'd love to see it. You can also share it on my Facebook page. Please pin this recipe to Pinterest too! Thank you for reading Recipes from a Pantry. 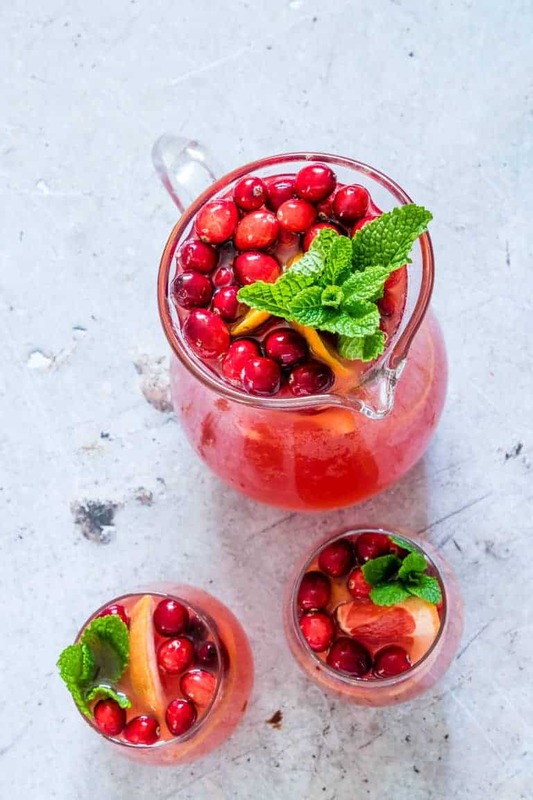 This Festive Fruit Punch is easy to make and super versatile. Perfect for all your holiday entertaining! Make an ice ring to float inside the punch and keep it chilled longer. There are 6 Freestyle Points in one serving of Easy Festive Fruit Punch. 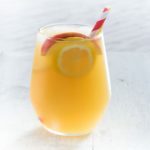 I love the flavors in this punch – ginger beer is so awesome! I’m not a drinke, but I’m sure this would be great with no alcohol. Perfect party drink! Those beautiful colours would be a stunning addition to our family lunches! I am really going to enjoy getting creative making some ice rings! I just love that pretty color! So festive and perfect for a holiday party! So perfect that I can have this all prepped and ready to go for quick refills during the party. It’s so pretty and festive that I’m sure my guests will love it!